We often return to our stylish trouser model 1043PB, and there is a reason for this. The model has been developed in a number of various way, and these shorts provide yet another variation. The main fabric is thin and flexible, creating very comfortable painters' trousers, and together with the generous stretch paneling, mobility and comfort are excellent. • Semi-panama weave in cotton/polyester for best wear resistance. • Stretch fabric at the front, front of the knee and entire calf for good mobility, comfort and airiness. • Stretch and a narrower fit create more fitted shorts. • Special fit, silhouette and waist create shorts that fit just right. • Reinforced hanging pockets with large volume. 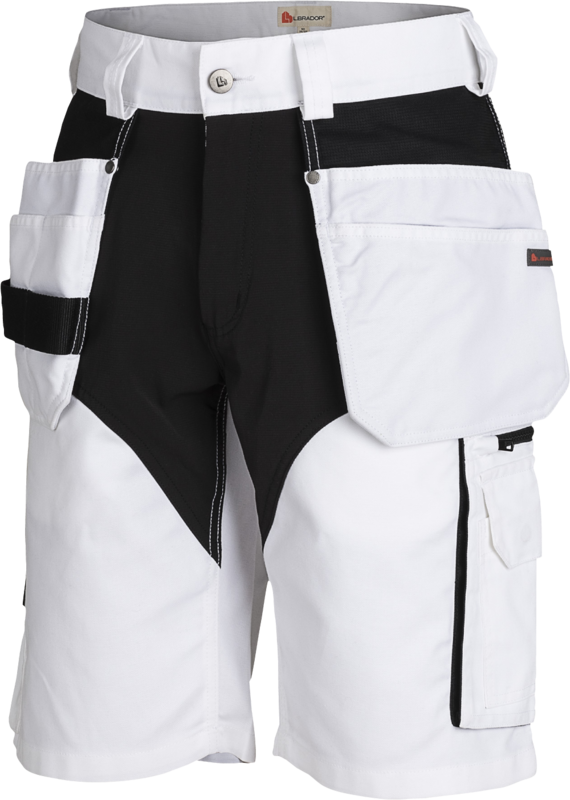 • Ventilation on the inside of the thigh adjusted by zipper, internally lined with mesh fabric keeps the user cool. • Left leg pocket with correctly angled phone pocket equiped with magnet closure keeps the phone protected and in place. Two hanging pockets, four front pockets and two rear pockets. Folding rule pocket, leg pocket with zipper, external phone pocket and ID card holder on the right hanging pocket.